At the beginning of this semester, faculty across the District received email messages from their deans that were far more directive than previous semesters’ “Welcome Back!” messages have been. Across the district, in addition to their usual reminders about waitlisted students, division meeting schedules, and faculty door cards, many deans instructed faculty to list the relevant Student Learning Outcomes on their syllabi, and provided faculty with boilerplate language about hour by arrangement requirements that, they asserted, must be included on all syllabi as well. Although this issue has just come to AFT’s attention, upon further investigation we have now learned from faculty that the deans of some divisions at CSM and Skyline have been sending faculty a similar message about including SLOs on syllabi for several semesters while other faculty say this semester is the first time they have received it. 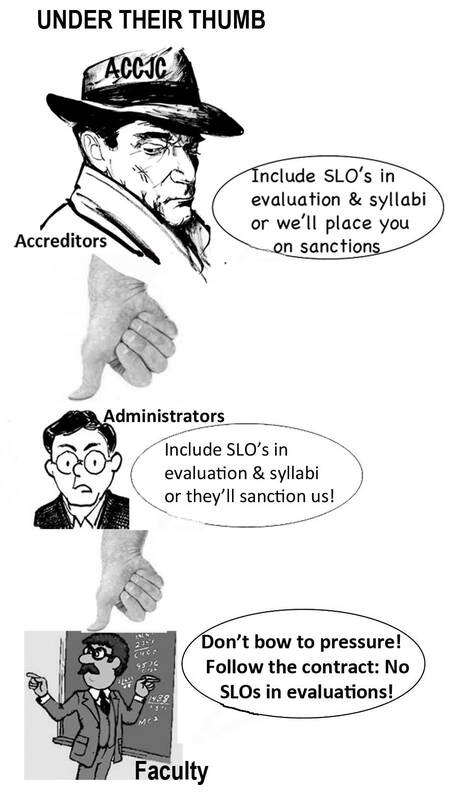 The deans’ memos all point to accreditation requirements as the impetus for the syllabi-SLO checklists. Although none of us wishes to repeat the accreditation nightmares suffered by CSM and Cañada College six years ago, the insistence that our hands have been tied by the requirements of the Accrediting Commission for Community and Junior Colleges (ACCJC) has become, for many faculty, a tired excuse for a lengthening pattern of unilateral decision making and unshared governance on the part of the District and college administrations. Not only have the ACCJC demands on our colleges significantly increased faculty’s administrative workload (exhibit one: the ever-expanding Program Review), but the District’s unilateral response to these demands is now restricting faculty’s fundamental right to academic freedom and violating our collective bargaining agreement. AFT 1493 insists that academic freedom, both in principle and as defined in the District’s own statement, gives faculty the right to present their courses as they believe to be most appropriate, and this fundamental right includes the preparation and content of syllabi. Faculty, as discipline experts, have created SLOs for their courses. At Skyline and CSM, these SLOs are included in the official course outlines. But even when SLOs are part of the course outline of record, an individual course syllabus remains the exclusive domain of each individual faculty member. This is not to say that course descriptions are irrelevant. Official course outlines set the parameters for our courses. For sequential courses, for example math and English programs, course outlines describe how each course leads to the next, ensuring that students are well prepared for each course in the sequence, regardless of the individual sections they enroll in. In this way, course outlines help to provide program coherence. Before SLOs “arrived,” course outlines were guided by what we called “course objectives.” In many departments, those objectives simply were renamed SLOs and, if necessary, rephrased so they could create a parallel list following the clause, “Upon successful completion of the course, the student will be able to . . . .” While faculty are expected, and rightly so, to teach their courses as described in the official course outlines, academic freedom preserves faculty’s right to teach a course as they wish within the parameters of the course outline. To put a finer point on it, a faculty member teaching “LIT 151: Shakespeare” may not turn the course into one exploring the Harlem Renaissance, but he or she is free to select which of Shakespeare’s works to include on the syllabus and to teach those works from any critical perspective that he or she feels is appropriate. Appendix G includes the following regarding portfolios: “Course syllabus, including description of grading policy, textbook (title, author, publisher and date) and description of supplemental material used in course such as computer software used in lab and student guide” (Appendices, p. 16). And Appendix G states on the Report of Peer Observation and Portfolio Review: “The portfolio review indicates that the following items were present: Course syllabi, including description of grading policy, textbook and supplemental material” (Appendices, p. 20). Faculty contact information, specifically office location, telephone number, and email address. None of the statements in our contract aims to provide an exhaustive or exclusive list of what must or must not be included on syllabi. The two statements from Appendix G do not mention office hours, for example, which is the only specific item mentioned in the rest of the contract. However, these items are the only ones that the District can require faculty to include in their syllabi. Whatever else appears on a course syllabus is the exclusive purview of each faculty member. So, when a faculty member who does not include SLOs on his syllabi receives an admonishing email message from his dean that says, “As part of accreditation requirements, SLOs are to be explicit on course syllabi. Please revise and resubmit by Monday the 6th,” the District is violating that faculty member’s academic freedom and our collective bargaining agreement. Nevertheless, AFT has learned that the District has begun evaluating faculty on whether or not they include SLOs on their course syllabi, and deans have been instructed to monitor tenured faculty’s participation in SLO development and assessment and to include that information in their Dean’s Report when tenured faculty undergo peer evaluation. (AFT has, in fact, filed an unfair labor practice charge concerning the latter contractual violation.) Because the evaluation process outlined in the collective bargaining agreement includes neither specific SLO requirements nor any detailed requirements for course syllabi, the District has clearly and flagrantly violated the contract by requiring that faculty include SLOs on their syllabi and by evaluating tenured faculty, in part, based on their participation in SLO development and assessment. AFT 1493 has requested the District cease and desist both practices. That said, it is not AFT 1493’s contention that faculty should refuse to include SLOs in their syllabi. Rather, AFT adamantly believes that the decision whether or not to include SLOs in a syllabus remains specifically with each individual faculty member. AFT 1493 understands very well the pressure that community colleges across the State are being put under by ACCJC and other accrediting agencies, and our Local has always made clear its willingness to work with the District in forging legal and effective responses to those pressures. However, time and again, the District has elected to act unilaterally, in some instances without even notifying the Union of its decisions. For example, in the accreditation updates that both CSM and Cañada College filed in response to their accreditation warnings, the District forwarded to accreditation teams language about including SLO assessment in faculty performance evaluations that was, frankly, an utter falsehood. That language came to AFT’s attention through faculty observation, not from District officials, and, had AFT not insisted the District revise it, the implication was that CSM and Cañada College would have filed reports with the ACCJC that were, essentially, fraudulent. All changes in our contract must be made at the negotiating table; no judgment or demand of the ACCJC can supersede this plain legal fact. At all three Colleges, faculty’s opinions about the value of SLOs vary quite a lot. Some faculty see SLOs in all forms as forced standardization and a giant leap towards what will become higher education’s version of No Child Left Behind. Other faculty feel SLOs bring cohesion to programs of study within our colleges and across our District. Some departments find SLO development and assessment a valuable activity that helps faculty bring their courses into sharp focus. Other departments experience SLO development and assessment as a complete waste of time. Regardless, AFT’s position remains: faculty are free to include or not include SLOs on their syllabi—the decision is theirs and theirs alone—and tenured faculty must not be evaluated, in any way, based on their participation in SLO development and assessment. 2 Faculty who are not familiar with our District’s Academic Freedom statement can read it here: http://collegeofsanmateo.edu/generalinformation/academicfreedom.asp. All three College’s statements are identical. Last semester the faculty overwhelmingly voted NOT to endorse a tentative contract agreement with the District. The union carried out a successful educational campaign proving that the District was disingenuous in its protestations of poverty at the bargaining table given the salary increases awarded to one group of managers immediately after the tentative agreement was signed. How could this not enrage faculty? So where do we go from here? Directly into what is known as Fact Finding, a process that is pursued when Impasse has been reached and a contract cannot be satisfactorily settled. In this process, a three-person panel evaluates both the District’s and the union’s contract proposals as well as other financial data and attempts to propose a fair agreement. The panel is made up of one representative chosen by the District, one chosen by AFT and a neutral Arbitrator. The union has selected our representative, and we are very pleased that this person will serve on our behalf. We are working with the District to select the neutral chair from a list provided by the state. Our Chief Negotiator, Joaquin Rivera, will make the AFT’s presentation to the panel. We are in the process of gathering data in preparation for our presentation, working with CFT experts who have gone through the fact finding process in other districts. We hope fact finding will take place within the next month or two, but we will let you know as soon as we know. Meanwhile, you will be hearing from us with more facts and figures that speak to the situation of faculty, full-time and part-time. Once again, we will show you the real numbers that tell the stories of our instructors, including full-time & part-time salary comparisons with other districts in our area; the doubling of out-of-pocket costs of full-time health benefits and the pitiful amount of benefits’ stipends for part-timers, etc., all in the context of the District’s decision to award salary increases to administrators and managers and the fact that the District’s 2010-11 ending balance–22.1% of annual expenditures–is far above the minimum state-required reserve fund, which is 5%. This has been a long bargaining process – going on three years – but we are hopeful that we will conclude it with a satisfactory agreement for all faculty and that we have your support as we continue the battle for fairness and equity for SMCCD faculty members. As part of an epidemic of higher education institutions ridding themselves of educational television and radio licenses, the San Mateo Community College District has announced the upcoming sale of KSCM-TV, although not (yet) KSCM-FM, the district’s jazz radio station. Bids were due on February 14th to the District’s Board of Trustees. As usual in these sales, the district’s managing board has issued a statement to the effect that broadcasting in the public interest is a distraction from the primary mission of the college: to educate students. The statement could have been copied word for world from similar trustee statements at the University of San Francisco, Rice University, Vanderbilt University, Duquesne University and others whose divestiture of their broadcast assets has hit the newspapers. What may be most distracting to financially challenged higher education is the value of the assets themselves. Noncommercial radio and television licenses constitute a limited quantity product: and as brokers who deal in the product, like Marc Hand with Public Media Company, one of the potential bidders who attended a mandatory pre-bid walk through of KSCM-TV on January 10th, they are “beachfront property”. That is not entirely true. The Federal Communications Commission defines non-commercial educational licenses to broadcast as public trusts that belong to the American people and are leased out to meet the information needs of communities. So speculating on them like a Maui condominium is not exactly the intended purpose. What will happen to KCSM-TV after the sale? With several bidders, including Public Media Company’s Hand, closely connected with national public radio and KQED, the large public television empire that now spreads from Sacramento to Salinas, it doesn’t look unlikely KSCM may just blend into the existing public network. As KQED has long been criticized for a paucity of local and original content, this kind of media consolidation looks to reduce rather than increase broadcast diversity and alternative sources of information. Another potential bidder in attendance at the meeting was Daystar Television, the fastest-growing Christian televangelism network in the country, whose mission is to reach souls with the good news of Jesus Christ. Members of the higher education community might want to think about the compatibility of such a sale with the district’s statement of mission. None of this should be construed as a lack of sympathy with the financial challenges facing higher education today. Budget cuts have been ruinous. Any source of sorely-needed funds needs to be seriously considered, however some lines are always drawn. Leasing out the humanities building is not usually on the table. Educational assets cannot simply be up for auction to the highest bidder regardless of the public interest. The district has presented a financial argument that KCSM-TV has been a financial burden on the district. Yet at the recent Board of Trustee’s meeting, trustees confirmed that many expenses would shift to KCSM-FM after a sale, rather than go away completely. College students and faculty should be looking closely at this sale. Trustees should certainly be told that sale to a televangelist is unacceptable. And that any sale, if a sale is even necessary, must be guided by protecting the public interest in localism, broadcast diversity and a wide range of available points of view. Tracy Rosenberg is the executive director of Media Alliance, a Bay Area nonprofit that advocates for community media and democratic communications. She can be found at www.media-alliance.org. In early December 2011 the California Federation of Teachers and its coalition partners in Restoring California filed the “Millionaires Tax to Restore Funding for Education and Essential Services Act of 2012” with the state Attorney General’s office. This proposed ballot measure would increase tax rates on personal incomes in excess of one million dollars per year to provide desperately needed revenues to rebuild our schools and services. The Millionaires Tax Act will ask people who make over a million dollars per year to pay 3% more on any income over their first million, and people who make 2 million dollars per year to pay an additional 2% more, so that we can begin to reverse the decline of California. The Millionaires Tax would raise an estimated $6 billion per year for schools (early childhood, K-12 and higher education), senior, child and disabled services, public safety, and rebuilding roads and bridges. The Millionaires Tax will not solve all the state’s problems with one magic wave of the fiscal wand. California now suffers an annual state budget deficit around twice the size the state will receive from our ballot measure. But it’s an important start, and key to its success is that it gets the money from the people who have it and can easily afford to pay their fair share. Also key is that the polling shows this initiative by far has the best chance with the electorate. On Monday morning, February 6, CFT members and supporters in eight cities around the state stood for a couple hours in early morning light, braving high decibels and exhaust fumes pouring from thousands of cars and trucks, to announce the kickoff of signature gathering for the Millionaires Tax, bound for the November 2012 ballot. Student groups in the District are making plans to participate in a statewide and national Day of Action For Education on Thursday, March 1. They are also making arrangements for busses to take students to attend a statewide march in support of public education at the Capitol in Sacramento on Monday, March 5. 1. Repeal of the Plan Ahead Pay Ahead Program and a reinstatement of students who were dropped because of failure to pay fees. 2. Protection of the Child Development Center at Skyline. 3. Return full funding to Student Services and Disabled Student Programs and Services. 4. A fair contract and fair pay for SMCCCD faculty, adjunct faculty, and staff. 5. Stop the outsourcing of AFSCME jobs to non-union workers. 6. Protection of Basic Skills Courses. No more cuts to courses. 7. Support the California millionaires tax and oil tax. 8. Lower food prices on campuses. 10. Freedom of speech and freedom to assemble for everyone on campus. 1) Stop cuts to public education. Reverse the fee hikes, layoffs, and cuts in all levels of public education to at least their 2009 levels. 2) Refund education and public services by taxing the rich and the corporations. 4) Respect free speech and free assembly. No use of force against protesters on school sites. If you fail to issue such a statement, and if you fail to take concrete actions in this direction, we will begin a wave of actions, up to and including striking, beginning on February 1, 2012 to ensure that our demands are met. We call on all California students, teachers, workers, and their organizations to sign this Open Letter and to organize and mobilize around it at their sites and in their communities. We call on the UC Regents to immediately sign this Open Letter and join us on our Nov. 16 march on the banks and the State Building beginning at 1pm in San Francisco, Justin Herman Plaza. Proposition 1522 is an initiative that taxes the oil companies when extracting natural resources from the ground and sea depths. It is written in the document that the oil giants cannot increase gas prices because they would be subject to fines; we are the only oil-producing state without such a fee. In recent months, students have come together across the state to save classes; prevent the loss of faculty jobs, and to cut tuition/unit fee costs. We the students, along with faculty and fellow AFT unions, have been distributing petition forms out to the public to sign and put on the 2012 general election ballot. Although this is a tedious process, we are persistent and are fulfilling our obligations by fighting for students rights. The initiative brings in $3.5 billion to education, of which when calculated, adds to $493 more per student. On January 25th, the Board unanimously approved a resolution to support this Initiative. Although there are others out there, this is the only initiative that provides money just for education. It was said by the Board that they, “support all action taken by the constituencies on each of the campuses,” as written in the resolution (12-1-3B). In regards to what students are doing, we are tabling at student held events, talking in classes, and are reaching out into the community. I, and fellow members from across the state, are on weekly conference calls, where we discuss upcoming events/conferences, are planning for the march in March (March 5th) and much more. Two weeks ago, at Laney College, Skyline Professor George Wright and many others talked about the educational situation going on in the state. In addition, the Facebook group page, Tax Oil to Fund Education in California, has current information and documents that go into more depth on the situation. Please note that we are gathering signatures until April 15th, 2012, when they are submitted to the county circulator’s office. We need 504,760 signatures state-wide to put this initiative on the ballot, and all help is appreciated. If you would like to help gather signatures, feel free to stop by the CSM Center of Student Life and Leadership Development, the Skyline Center of Student Life and Leadership Development (Katelyn Smathers), or the AFT office at CSM for petitions or any questions. In the last issue of the Advocate, my “Know Your Rights” article ended with the strong recommendation that you read the AFT contract. So often we postpone reading the AFT contract, thinking: “I will if I ever need to. I can always phone or e-mail my Chapter Chair(s) or a Grievance Officer should I ever have a question. I don’t need to read the contract except to know evaluation procedures and my salary and benefits.” Maybe you will not need to know how many days and the necessary steps to take Emergency Necessity Days for a fire or flood, major home disasters, or severe health issues, but not following the contract can result in disciplinary actions up to and including being fired. What goes in your portfolio? As a part of your professional responsibilities you have an obligation to have syllabi, provide recordable methodology as to how you teach, test and evaluate. Your portfolio should be a record of what you do in the classroom with sample handouts, exams, photos of creative projects and even copies of your teaching creations, whether printed materials or photos of physical objects. An evaluator should be able to visualize your course structure, content, methodology and student evaluation by examining your portfolio. Some disciplines, by division or department, have agreed to use particular texts or other materials and expect instruction to follow this format. Not to do so may result in an unsatisfactory evaluation with a typed list of what that department expects as required materials/methodology in order to receive a satisfactory evaluation. A mentor is then assigned to any individual receiving an unsatisfactory evaluation to assist that instructor in complying with the expected level/methodology or depth of the subject to be covered. In the Tenure Review process this mentoring occurs by committee members when necessary throughout the four years. How often are adjunct faculty evaluated? Adjuncts are evaluated by one full-time faculty and/or their deans the first semester they teach any newly assigned course and every six semesters thereafter, provided they receive a satisfactory evaluation. The dean assigns a mentor or becomes the mentor him/herself to address the deficiencies whenever an adjunct receives an unsatisfactory evaluation. The contract does not stipulate how many successive unsatisfactory evaluations an instructor may receive but generally serious consideration for dismissal is considered after two or three unsatisfactory evaluations. Each situation may differ, depending on the severity of the unsatisfactory and how many students may or may not be impacted taking sequential or higher level classes. It is important for adjuncts to remember that the same course or equivalent at another community college, state college or UC or private college may have completely different expectations for materials, methodology and depth of content to be considered satisfactory in SMCCD. Not to adhere to these standards can result in unsatisfactory evaluations. Adjuncts who receive a satisfactory evaluation may not be evaluated again in the same course for six semesters. A satisfactory evaluation means a satisfactory in both the classroom observation and the portfolio. The evaluator must be very clear, preferably in writing, regarding what specific areas need improvement and how this will be determined, regardless of whether an evaluation is deemed satisfactory or unsatisfactory. I have heard too often from adjuncts that no suggestions or requirements for improvement were made by the evaluator, yet a subsequent evaluation is scheduled for the following semester. All specific deficiencies must be written as a Professional Improvement Plan and given to the adjunct as soon as possible following the classroom observation meeting with the adjunct. This plan becomes a part of the evaluation documentation and will be given to the next evaluator. The actual classroom observation from previous evaluations will not be given to evaluators or peer review committees. Adjuncts need to phone or e-mail a Grievance Officer immediately when an evaluation is requested for the same course the semester after receiving a satisfactory evaluation. This is true if the evaluation was for online or classroom, taught on campus or off campus, to college age or high school. This is most irregular and probably against contract regulations. All faculty may be subject to additional evaluations should their performance, behavior or quality of overall teaching be called into question due to a physical or mental illness, substance abuse or inability to cope with life’s stressors. This is the exception, however, and not the rule. Do you know who your Chapter Chair(s) and Grievance Officer(s) are? Do you know who your Chapter Chair(s) and Grievance Officer(s) are? They are listed on page 2, with their phone numbers, in every Advocate and they are also listed on AFT 1493’s website, aft1493.org. Consider becoming an AFT 1493 leader: Run for union office! All AFT members will be receiving nomination forms for the next AFT election in their campus mailboxes in mid-April. Please submit names of any AFT member (your own included) for election to office for the 2012-2014 school years. Terms of office begin and end officially at the May Executive Committee meeting. We would like to take this opportunity to encourage all faculty members to seriously consider either running for office or nominating a colleague. No previous experience is necessary and present office-holders are eligible for re-nomination. Job descriptions for each position are available in the Union Handbook on the AFT website. All positions, with the exception of part-time faculty representatives, are open to all full-time or part-time members. Nominees for Chapter positions must be from the specific college being represented. In voting that took place during the last couple weeks of January, AFT 1493 members voted–92% in favor, 8% opposed–to approve amendments to our Local’s Constitution. The changes were proposed by the Executive Committee so that our Constitution will reflect current practices, as opposed to old ones that have been discontinued or are no longer valid, and will provide more clarity, by resolving ambiguities or by explicitly addressing areas where our previous Constitution was silent. You can read a summary or the approved changes in their entirety on the AFT 1493 website, aft1493.org.